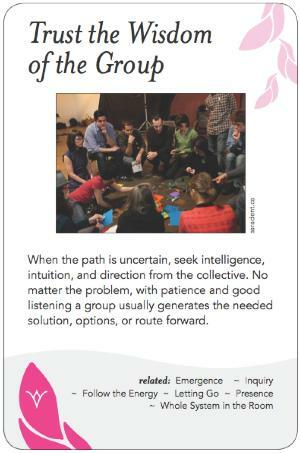 When the path is uncertain, seek intelligence, intuition, and direction from the collective. No matter the problem, with patience and good listening a group usually generates the needed solution, options, or route forward. The collective knowledge of a group is greater than any individual's -- even an expert's. Better outcomes result when that collective knowledge is canvassed, shared and integrated. There are other things that collective groups are not particularly good at doing -- notably research and invention; these tasks are better left to individuals to pursue and bring back to the group. The consensus of a group is usually, but not always, better than the results of voting or allowing one person to make a decision. Groups can be influenced by very articulate or powerful members, or be susceptible to "groupthink", the desire to please or come to agreement. Sometimes the group is not only best at sharing and integrating their knowledge, perspectives, ideas and insights, but also at determining what is the best process to follow to achieve their purpose and intention. Group decision often requires a willingness to trust that the group's experiences and wisdom are valid, even when they conflict with one's own experiences and wisdom. Following the Wisdom of the Group involves not a blind faith in the group decision, but a willingness, after divergence and convergence, to let one's personal wisdom inform rather than dominate the wisdom of the group. Inherent in this pattern is a belief that in any group is all the knowledge that's needed to thrive. In addition to the facilitator trusting the wisdom of the group in addition to her/his own perceptions, this can involve helping dissenting members of the group move to a willingness to appreciate and accept the group's wisdom. Often the degree to which a group member doesn't trust that group's wisdom is directly related to the degree that member will rely on the facilitator as expert. Be careful not to circumvent necessary divergence in the name of following the wisdom of the group - that wisdom is often best accessed through the collision of diverse ideas. There can be a fine line between trusting the wisdom of the group and witholding concerns which can benefit the group. See Naming. Beware of "groupthink", and the tendency for a group to prematurely accept positions that are expressed by people of power, or by people who are highly admired or articulate. Beware of groups arriving at consensus from a position of ignorance. Uninformed groups are mobs, and they have little collective wisdom. At times one's construct of the situation can get in the way of letting the decision process flow properly. Sometimes you just have to be comfortable with your discomfort around not completely understanding the situation. In the midst of challenging process, or when building an agenda for a particularly challenging issue, it's possible to shut down as facilitator and get blocked around how to move forward. Oftentimes, the group will move to the process it needs if we let it. James Surowiecki's "The Wisdom of Crowds".